EB GUIDE is the technology behind some of the best industrial user interfaces in today’s cars. With EB GUIDE you can create best of breed head unit and instrument cluster HMI’s. EB GUIDE is more than a tool – it enables an automotive SW development process, leading to world class automotive HMI. EB GUIDE lets you control HMI development and do so across multiple suppliers, car makers, or car models. With EB GUIDE, you can model and simulate the HMI on your PC and deploy it easily on your target—all with the same look and feel. 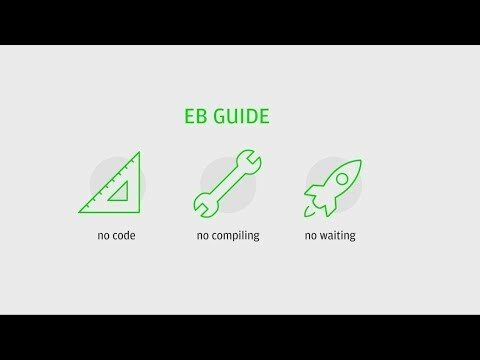 Moreover, EB GUIDE allows multiple users and distributed teams to work on the same model. Seamless integration of graphical, haptic, and voice user interfaces enables you to create a consistent user experience. Deliver the advanced user interfaces your customers want, including 3D support, animations and effects, as well as the latest speech technology. For more than ten years, EB GUIDE and EB experts have been assisting HMI developers worldwide. We continue to be an industry innovator. EB works with leading international chip vendors and technology providers to extend and improve EB GUIDE continuously according to the market’s needs. Ready-to-use widget template libraries so you can simply start modeling right away instead of spending time creating widgets from scratch. Download now. A powerful tool for intelligent multimodal HMI product development. EB GUIDE Studio lets you deliver the most advanced HMIs to your customers while staying on budget. Ensures that the powerful graphical interfaces you develop in EB GUIDE Studio render beautifully and are executed on your target in the vehicle. Lets you design innovative speech dialogs while shortening development time for your HMI. 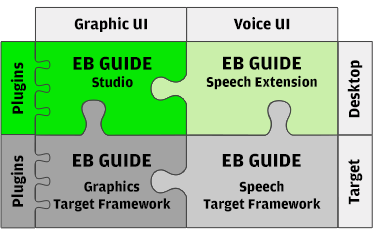 Interprets the speech dialog model on a user device, once you’ve developed it with our EB GUIDE Speech Extension. EB arware is a software framework that enables the creation of augmented reality solutions that enhance the driving experience. A customizable, scalable navigation solution that lets you give drivers the newest features in navigation, including high-end 3D maps and driver assistance functions. EB Assist ADTF is a tool for the development, validation, visualization and test of driver assistance and automated driving features. EB robinos is a comprehensive, hardware agnostic software solution for highly automated driving systems.